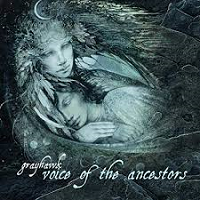 Grayhawk (Christopher Gibney) recently released Voice of the Ancestors, the third and final album in a Shamanic Trilogy. He is a man that has been healing from the tragedy of losing his toddler son. He has transitioned from that pain and loss and transformed his life with more purpose to help those that have special needs. Also created is a foundation in honor of his son to help those with neuroblastoma, a catastrophic pediatric cancer of the sympathetic nervous system that took his life. Obviously, his music holds many meanings but the primary goal is to ascend to a higher place, heal the soul, and in essence become reborn with new life and purpose. Voice of the Ancestors features the usual lineup of stars from the New Age genre that find their way on to most of the releases I have the honor of hearing. Grayhawk plays the synthesizers as a base instrument then there is so much more that contributes to the overall sound and textures of this release. To say it is World music is correct but with a New Age concept and approach. The ancients held many traditions and ceremonies all over the world. What this recording captures is the very spirit and color of that diversity and beauty. There are native flutes, worldbeat percussions, viola, ambient guitar lines, and gorgeous vocalizations, particularly on “Peace Prayer.” The track runs over 10 minutes and takes 160 tracks of invocation of English, Hebrew, Farsi, and Arabic. There is also the shorter version, a little over 5 minutes for the internet streaming stations to play. Honestly, I have heard similar tracks but nothing like this before. The blend of all the languages balances with the English word, which is still heard so you can listen to the translations at the same time, amazing. This is the kind of track that deserves worldwide attention and should be heard on every inch of the globe. Grayhawk has created a work of genius that encompasses music, words and a powerful spiritual message. This is a brilliant example of a man taking his personal tragedy and using it to give back to the universe his love and healing. I can hear this playing in the background of a cinematic tribute to the different peoples of the world and how they worship and provide music for their people. Voice of the Ancestors is an incredible gift for all to enjoy. Listen closely, you may hear the whispers of your own ancestors in this music.